The Internet is a game-changer. Small businesses compete with large corporations on a level playing field (okay, well, sort of). Big businesses still have advantages, of course. Advertising budgets are larger and corporations spend thousands on market research. You can’t do that as a small-business owner. That’s OK. 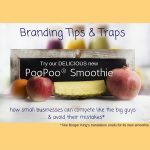 If you brand your business the right way, you can still give the big boys a run for their money. Here’s how. I Already Have a Logo, You Say? The Business Dictionary defines branding as “The process involved in creating a unique name and image for a product in the consumer’s mind.” The purpose of a brand is to establish a presence in the marketplace and make a business stand out from the rest of the pack. Although a logo is part of it, branding takes on the wider role of personifying a business. Attracting and retaining customers – that’s the goal. Your product or service may or may not be exactly the same as your competitor’s but your mission and business philosophy are assuredly different. If people find your company image compelling, they’ll not only find you, they’ll come back. You started your small business for a reason. Your products or services solve a problem for someone. You know your business better than anyone. Ask yourself, “If my business became human, what kind of person would it be? The caring friend, resourceful helper or knowledgeable expert?” Figure out what type of human message you want to send. Most important, however, is get to know your target audience inside and out. What are their goals, concerns and habits? Don’t know? Ask them. Use customer service surveys, emails, Facebook posts and verbal communications as well as market research and internal statistics to hit on what makes them tick. Your customers are people. Appeal to their feelings and minds and you’re halfway there. A Rose by Any Other Name May Smell Like a … Skunk? What’s in a name? In the case of your business brand, it’s everything. A brilliant branding concept will fall flat if your brand name doesn’t fit your business and mission. Worse, if you have to rebrand down the road, you can expect to see a 5 percent to 20 percent sales drop. Try to get it right the first time. And, a word to the wise: if you expect to do business globally, make sure your brand name translates well. 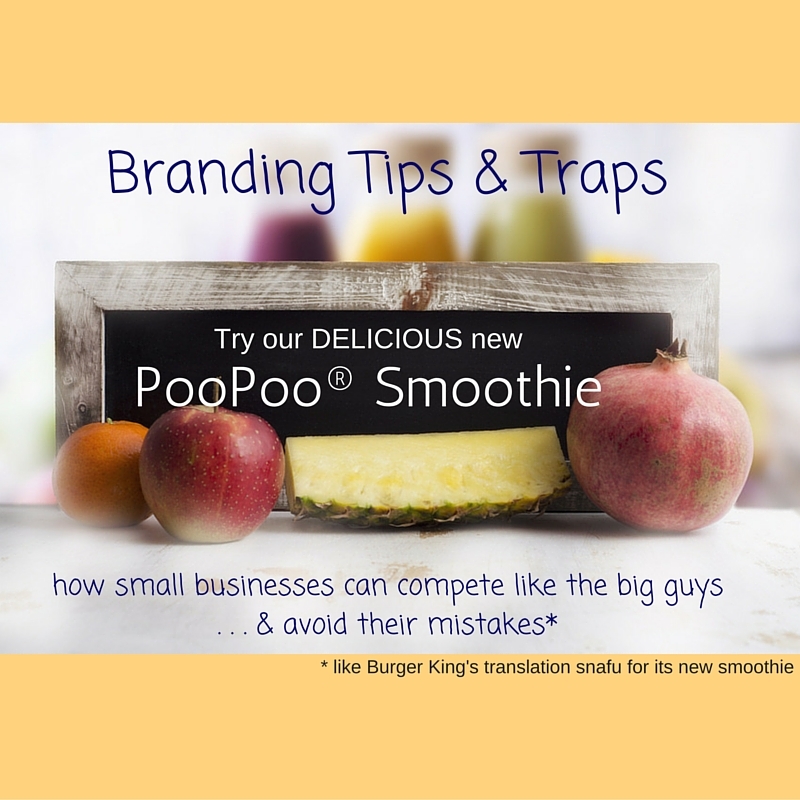 For example, in China, Burger King’s signature smoothie becomes the PooPoo® Smoothie when translated into English. Tasty! Branding is more than a logo, but your logo and color choices are important parts of the overall concept. Your logo is the visual representation of your business. Make sure it creates a positive impression that fits your business philosophy. The benefits of looking like a pro far outweigh the cost of hiring a graphic designer, so go ahead and spend a little now. Logo design is not for the novice. Once procured, incorporate the logo into everything from employee uniforms to the company website. Anyone who’s been in business very long knows that nothing comes easily. In fact, the best-laid plans don’t always work. If you’ve experienced a business failure or two, you also know that failure can be the catalyst for success in the long haul. How? Take the example of a printer and toner cartridge sales firm. Designers created a cute and witty cartoon character named Dave to be the face of the company. Unfortunately, customers were less than thrilled with Dave. Cartridge Save managing director Ian Cowley says Dave’s failure was a critical turning point in the company’s branding strategies. Refocusing its efforts on company core values of best prices, fast delivery and excellent customer service, Cowley and Cartridge Save used the experience to learn what worked and what didn’t when it came to their customers. If change becomes necessary, learn from it and move on. Once you hit on a successful formula, it’s tempting to keep following it after it’s lost its oomph. Don’t let your image become outdated or passé. Innovate and try new things. Customers expect fresh ideas. Branding is not an instant process. Take your time and move forward. As long as your branding strategies stay true to your business niche and serve your target audience, you can successfully compete with the big boys.